Nižinskyj | Conservative Political Comment: Is Lord Oakenshott a racist? 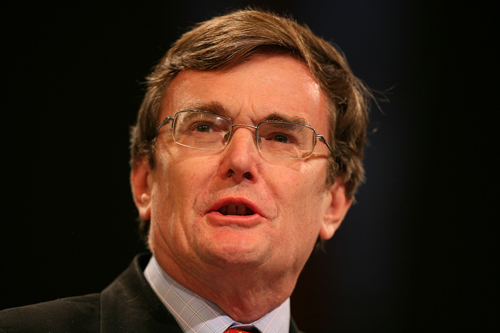 Is Lord Oakenshott a racist? There's a nasty strain of racial superiority in this country when it comes to the subject of our eastern European neighbours. To many people it seems as though our brothers are a kind of subhuman race of vodka-swilling, Jew-baiting fascists, incapable of any sort of humane or rational form of government. It's become all too easy to make this sort of comment in Britain without any consequences and, from most people, à la Borat it can be easily shrugged off. Not that it makes it any better, but it's usually meant in jest. But for a man like Lord Oakenshott to make such a slur, in all seriousness, on Sunday morning television is truly disgusting. On the Politics Show this morning, the Liberal Democrat peer said the Conservatives had lost influence in Europe by leaving the European People's Party and joining with 'the headbangers in eastern Europe' - adding he would have much preferred us to be discussing with 'our friends and allies in western Europe'. For one thing, this is hardly a very 'European' attitude to take - that somehow easterners are barbarians outside of western European civilisation and ought not to be around the big table. While it can be said there exists a certain severity to eastern culture not seen here in the west, this is largely because it is a region which has witnessed the most brutal and bloody repression under successive mad tsars, kaisers, führers and commissars. However, one consequence of this - and in direct contradiction to the racist view of eastern Europeans - is a strong sense of discipline east of the Oder which we in the west trail far behind. It is the reason for that region's spectacular economic growth and, it is worth pointing out, for the popularity of easterners amongst our country's employers and home improvers. Yes, they may demand less pay than British workers, but they work bloody hard for it. And, as I have pointed out before, these 'headbangers' in the European Conservatives & Reformists Lord Oakenshott so offensively refers to are major parties in their respective countries. Law & Justice is currently the second largest party in Poland, as is Civic Democracy in the Czech Republic. Both have spent a great deal of time leading their countries. Even the smaller Latvian For Fatherland & Freedom party - an easy target if ever there was one for idiots like Oakenshott - are members of that country's government (and, in any case, since a recent merger it is called National Alliance). Secondly, it does seems as though this kind of prejudice is all too easy to get away with because its recipients happen to be white. I can hardly see such a slur getting away without any comment were the 'headbangers' Lord Oakenshott referred to of a different colour. Could one ever get away with saying 'the headbangers of Sub-Saharan Africa', for example? And the tired old argument - used by Oakenshott and presenter Jon Sopel - that Cameron withdrew the Conservatives from a place of influence in the EPP is absolute balderdash. This country has never had any influence in Europe. In so much as it did is down exclusively to Margaret Thatcher's handbagging and stubborn refusal to compromise this country's interests. Britain's relationship with the EU has always been that of a leech and its host and this was no different under europhilic prime ministers like Blair. What appears to confound these people, too, is that the decision to withdraw from the EPP was one of principle. It is a federalist party. The Conservative party is not. It believes in the 'social market economy'. Conservatives believe in the free market. What is astonishing is not so much that the Conservatives left but that they had remained members for so long.